For this recipe I've taken a cider braised ham so it doesn't quite have the authenticity of the lurid pink of the 60's product but in keeping with the spirit of the age I've accompanied them with some long retro pink flamingo skewers! 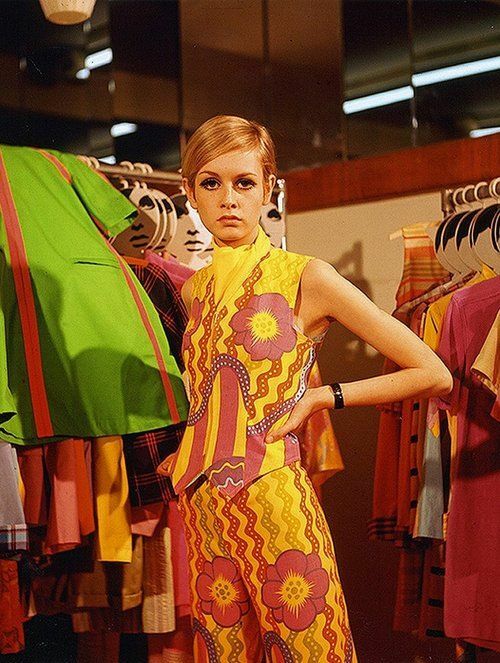 Left Twiggy, the face of the 'Swinging Sixties' in Biba, the epitome of the London fashion scene. Biba started out in mail order with just one pink 'Mod' gingham dress, similar to one worn by Brigitte Bardot, they received 4,000 orders on the first day. Biba was so successful it ended up in Kensington High Street in the former home of an earlier icon, beloved of Agatha Christie's, Miss Marple; Derry and Toms. Big Biba had a roof garden complete with pink flamingos! Cut the Gruyère into cubes and pour over the marinade. Make sure each cube is well coated and then cover. I marinated the cheese for around 2 hours and that gave me a great mustard taste but obviously you can experiment with a longer marinating period if you wish. Thread a cube of marinated Gruyère onto each stick and then add the other ingredients in a fiendishly studied but seemingly haphazard way. Mix in some longer sticks, preferably with something colourful attached like my flamingos! Do not have too much symmetry. For a real authentic 60's look, the sticks should be served by pressing them into a half grapefruit or water melon, in the manner of porcupine quills.